Apple Pay is now accepted on all forms of public transit that accept Mastercard credit and debit cards in Singapore, including buses and trains, enabling convenient tap-to-pay functionality with an iPhone or Apple Watch. Singapore's transit agency expects to add support for Visa cards in the second half of 2019. New York City will pilot Apple Pay on a couple of lines this spring and then roll out the functionality to additional lines throughout the rest of the year, according to TechCrunch's Matthew Panzarino. The MTA appears to already be in the process of installing contactless card readers at turnstiles, with a test phase "coming soon." Chicago's and Portland's transit systems already accept Apple Pay, but CTA and TriMet riders will be able to add their preloaded Ventra and Hop fare cards to the Wallet app later this year and take advantage of pre-tax commuter benefits, according to the Chicago Tribune and the Willamette Week. The payment process is similar to using Apple Pay in stores. Depending on the iPhone, that means double-pressing the home button or side button, authenticating with Touch ID or Face ID, and holding the iPhone near the card reader. Apple Watch payments are also activated by double-pressing the side button. 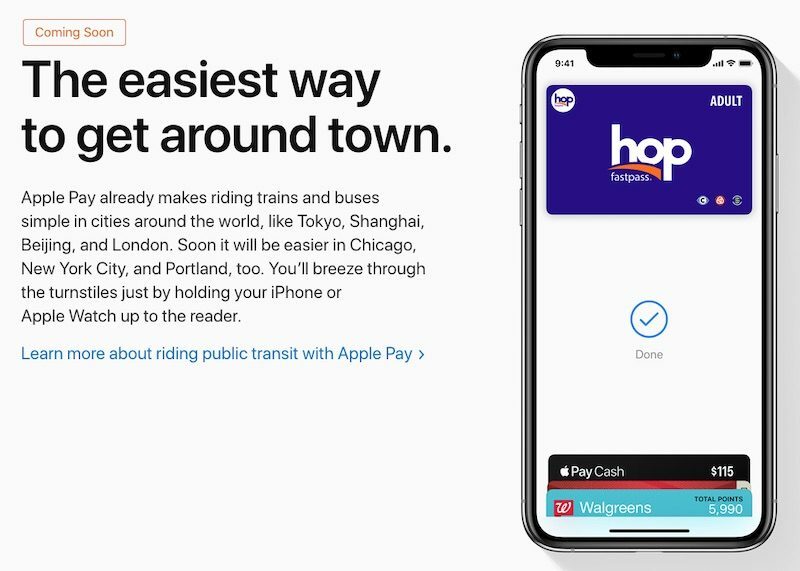 The blog Ata Distance suggests that Ventra and Hop cards will support Express Transit, meaning that riders won't need to authenticate with Face ID, Touch ID, or a passcode, and won't need to wake or unlock their device, to pay. Express Transit is currently limited to transit systems in China and Japan. "that means double-pressing the home button or side button, authenticating with Touch ID ('https://www.macrumors.com/roundup/touch-id/') or Face ID, and holding the iPhone near the card reader." This takes too long. I know it seems fast, but I've been in NYC and ridden the subway quite a few times and it's a constant flow of people through the turnstiles, each person swiping their card through as they're walking. If there's any kind of delay, like having to satisfy FaceID or wait for TouchID, it's going to slow things down and people will get pissed. Nevermind that TouchID doesn't work with gloves on and NYC has winter, and FaceID doesn't always read correctly. If I were a New Yorker I wouldn't bother with using my phone and just get the Contactless MetroCard equivalent they're no doubt going to offer. I would hope you wouldn't need to authenticate to get it to work. Would be alot easier if you just hold phone to reader, phone realizes it's a subway terminal and loads that specific card, and boom you're in. I could see alot of people fumbling around getting the right pass up on their phones, standing there authenticating with FaceID, then scanning, and causing a backup. IMO the ticket wouldn't really need to be secured behind FaceID and should pop up automatically when presented at a subway terminal. you're overthinking it - almost every day there is some dumbass blocking a turnstile while trying to locate his/her metrocard. they will just be replaced by the dumbasses who fail to unlock their phone prior to reaching the turnstile. You could prepare it as you are walking up like before you get there. Then just hold it up there. You have a minute leeway from activating Apple Pay until it times out; so, by rights, no one should be fumbling around at the point of touching in/out to ride transit. Samsung Pay have the option to set up a ‘transport card’ without the need to use biometric authorisation so I hope, in time, Apple follow suit. Apple doesn't need to follow suit. It already has Apple Pay Transit Card feature in China and Japan long time ago. This is exactly how it works here in Shanghai. Every time I just wave my Apple Watch at the terminal without having to do anything else, just like magic. London really needs Oyster card integration in Apple Wallet (for season passes). No double-pressing required for Apple Pay in Japan. Just wave your iPhone or Apple Watch over the IC reader at the train station ticket gate or the grocery store checkout and you're done. This reminds me of a guy today who rushed to the start of the queue only to realise his card is in the wallet and the wallet inside his bag. It’s instant. You don’t do this as you’re at the gate. Double click the side button as you’re walking towards the gate and look at your phone. It’s ready as you get there and tap.